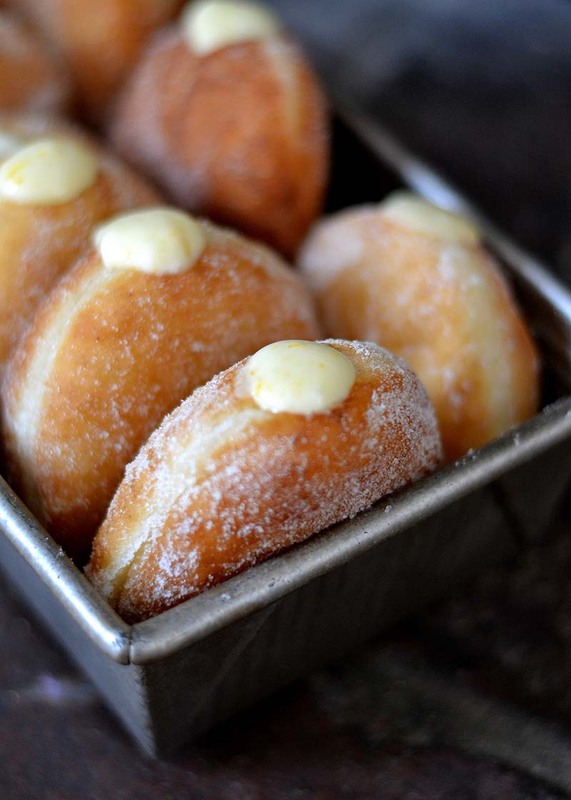 Airy yeast doughnuts, rolled in sugar and then filled with a creamy, tart Meyer lemon filling. In a small bowl combine yeast, warm water and sugar. Mix and then set aside for about 10 minutes or until it starts to foam. In the bowl of an electric mixer using the paddle attachment, combine salt, eggs and butter until light and fluffy. Mix in the milk, and 1 cup of flour. Add the yeast mixture to the bowl, mix until combined. Switch out the paddle attachment for the dough hook. Turn mixer to medium/low and add in more flour ¼ cup at a time. Continue to add in flour just until the dough is barely sticky. Turn mixer to medium speed and “knead” the dough until it slightly elastic. Turn the dough out into a large buttered mixing bowl, cover with plastic wrap, and set it someplace warm to rise until it has doubled in volume. Once the dough has doubled, turn it out onto a lightly floured surface. Roll the dough out to be about a ½ inch thick and cut into 3 inch circles (you can use a biscuit cutter, or a drinking glass). Place the dough circles on a parchment paper lined baking sheet. Do not re-roll scraps, they can be cut into small strips or chunks for extra snacking, or discarded. Allow doughnuts to rise one more time, until they have at least doubled in size, and appear to fluffy and filled with air. While the doughnuts rise, preheat cooking oil to 370°F degrees in either an electric fryer, or on a stove top in a heavy-bottomed Dutch oven. Fry each doughnut until it is golden on the bottom, flip and fry until the other side is golden. Be very careful when transferring the doughnuts to the oil. If they are handled too much, they will collapse. The finished doughnuts should be golden on each side, with a white ring around the middle - this shows a perfectly risen doughnut, and will ensure that it is nice and light in the center. Place fried doughnuts onto a paper bag or paper towels to drain any extra grease. Toss donuts in granulated sugar, and place on a cooling wrack to cool to room temperature. To prepare the filling, create a double boiler by bringing a pot of water to boil and placing a heat-proof mixing bowl on top. Whisk in lemon juice, zest, sugar and eggs. Continue whisking on the double boiler until it starts to thicken slightly. Drop butter into the mixture one tablespoon at a time. Once the butter has been added, continue whisking until it is thick enough to coat the back of a spoon. Remove from heat, and place in the refrigerator for at least an hour, or until it has cooled completely. Meanwhile, in a mixing bowl whisk heavy cream and salt together until it forms stiff peaks. Carefully fold in the cooled lemon mixture. Place in the refrigerator for at least another 30 minutes. Right before serving, cut small holes in the side of each doughnut with a paring knife, in the shape of an X. Place filling in a piping bag fitted with a round tip, a longer tip works best. Fill each doughnut, and enjoy!